During my sick days, I was craving craving craving for hearty comfort food. While others might crave for chicken noodle soup, I wanted food with powerful flavor, dense texture, and sweet lobster. What a woman wants is what a woman gets…muahahahaha. A butternut squash was sitting around in the kitchen. In someway, I had to use up before it became rotten. I ate a lot of risotto but never tried to make it at home. This is another first! I couldn’t believe how easy it was to make. Well, I still had to do the work. But I sent W off to the grocery with a list of ingredients to pick up. With the 6 cups of chicken broth in the ingredients, especially it’s free range, it’s hard not to believe it’s fill with flavor. Every spoon of the dish was umm umm umm umm umm. It was addicting. I couldn’t put my spoon down for a second. One after another. The lobster was like the icing on the cake. The sweetness of it balance with the savory flavor of the risotto whereas the squash added texture and crunch. On a cold fall or winter day, or even when you are under the weather, this dish will bring you up, satisfy your craving and warm your appetite. Bon appétit! Happy Friday! It’s Friday! Hope everyone a beautiful day and good eats over the weekend! In a medium saucepan, fill it up with cold water. 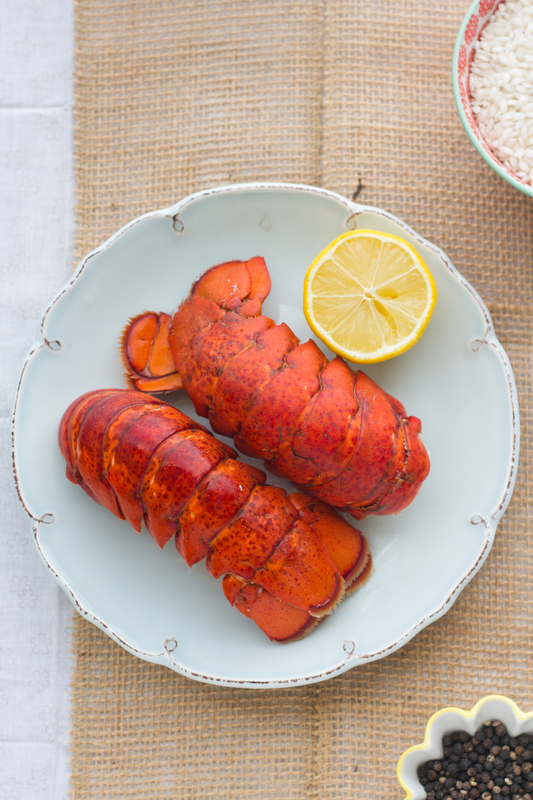 Add lobster tails. Bring it to a boil, about 10 minutes or until lobster tails turn pink. Remove for heat and drain. De-shell and cut meat in 1/2-inch cubes. Set aside. Preheat the oven to 375F. 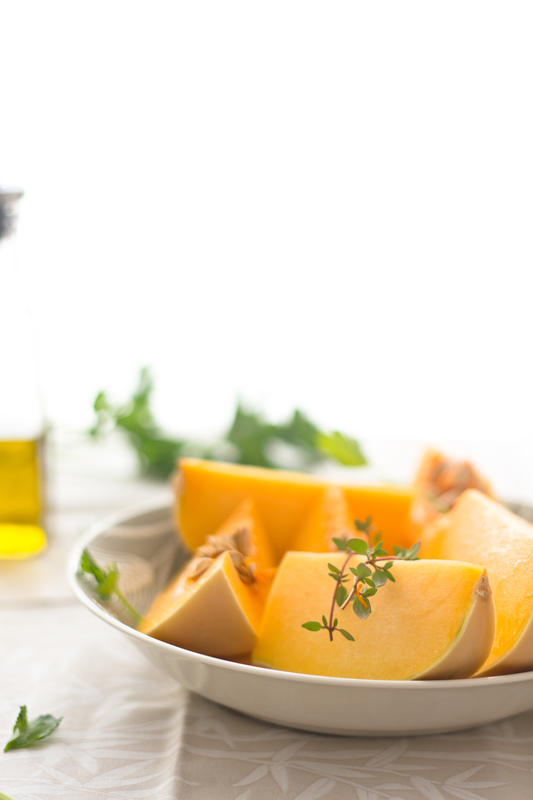 In a baking pan, toss the squash with olive oil and thyme leaves. Bake for 20 minutes, or until tender. Remove from oven and set aside. In a medium saucepan, warm the broth over medium-high heat. When the broth comes to a simmer reduce the heat to very low and cover to keep warm. Meanwhile, in a large saucepan, melt the butter over medium heat. Add the onion. Saute until tender but not brown, about 4 minutes. Add the rice. Stir and combine. Add 1 lb of butternut squash. Stir and combine, for about 5 minutes. Add the wine and simmer until the wine has almost completely evaporated, about 4 minutes. Add a cup of the simmering broth and stir until almost completely absorbed, about 3 minutes. Continue cooking the rice, adding the broth 1 cup at a time. Stir constantly and allowing each addition cup of the broth to absorb before adding the next. 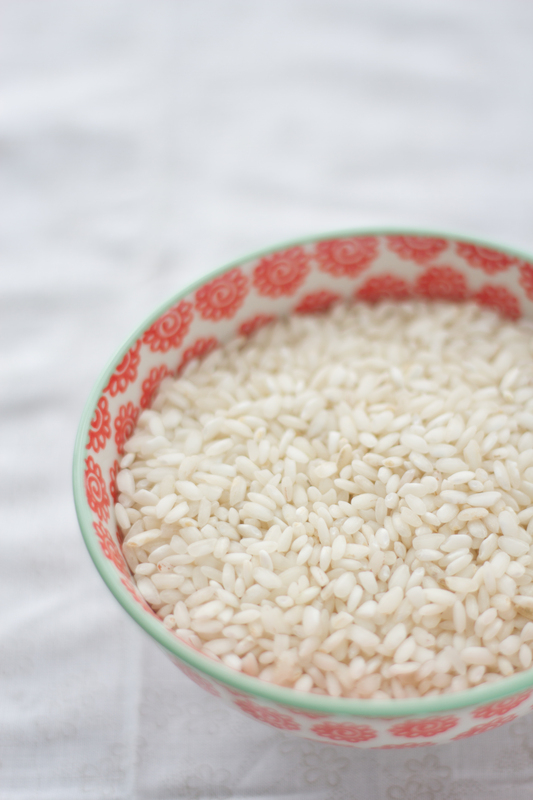 Cook until the rice is al dente, or mixture is creamy, about 18 – 20 minutes. Add the lobster cubes. Stir and combine, for about 2 minutes. Remove from heat. 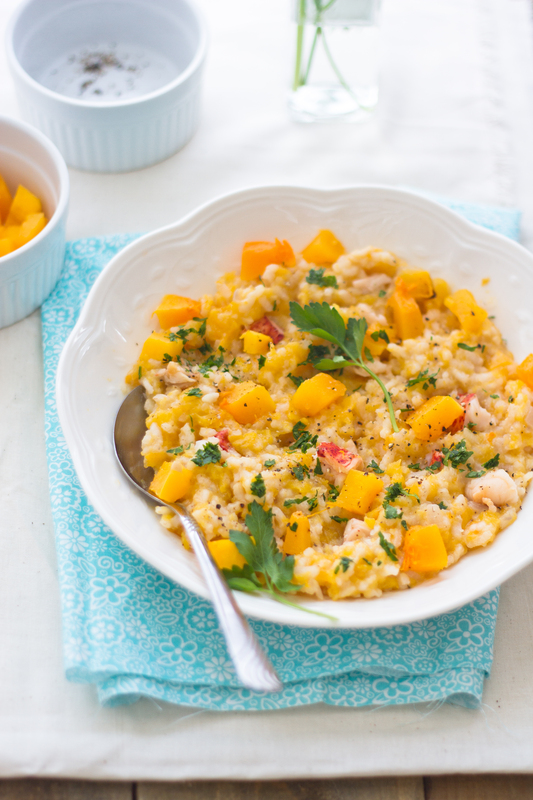 Transfer the risotto to a serving bowl and sprinkle with remaining butternut squash, parsley and pepper. Serve immediately. This entry was posted in Food & Drink, Italian, Quick Meal, Seafood, Squash and tagged butternut squash, comfort food, dinner, Food & Drink, food photography, hearty food, Italian, lobster, risotto. Bookmark the permalink. I haven’t had lobster in the longest time. remind me to eat some the next time im back in Singapore! 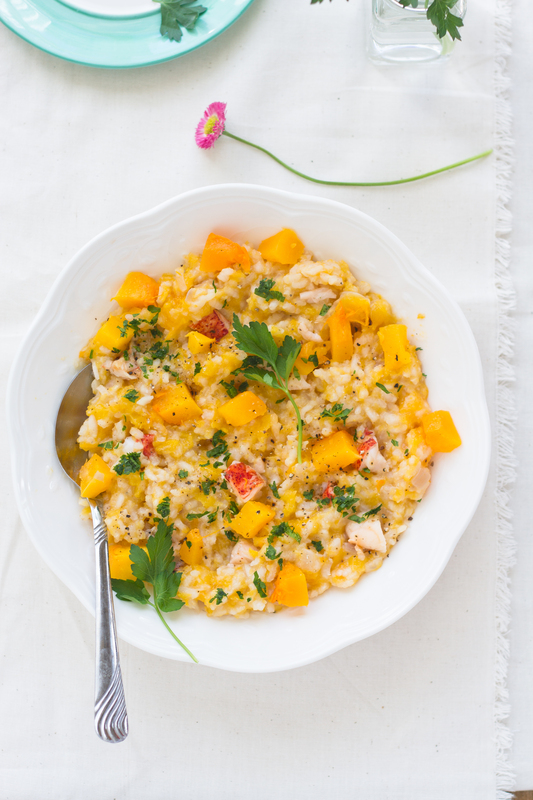 And great idea to combine butternutsquah with risotto! This sounds delicious and your pictures are beautiful! Hi, Irene! Thanks for visiting my blog, because now, I’ve discovered yours! And what a joy your little corner of the world here. 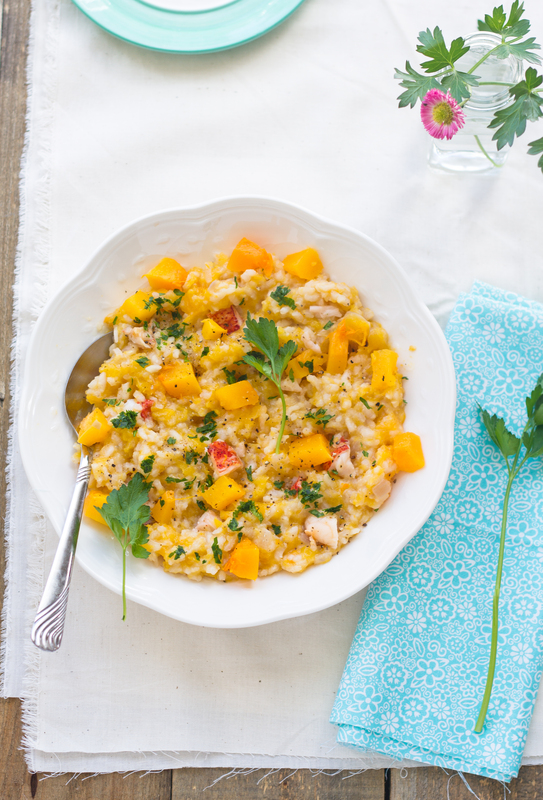 This risotto is almost too beautiful to eat…but of course, I’ll eat anything – anything! Including this. I just bought a packet of risotto rice recently. Tried porcini mushroom risotto the other day. Now I can do your healthy and gorgeous recipe. Or should I just pop over to taste it?